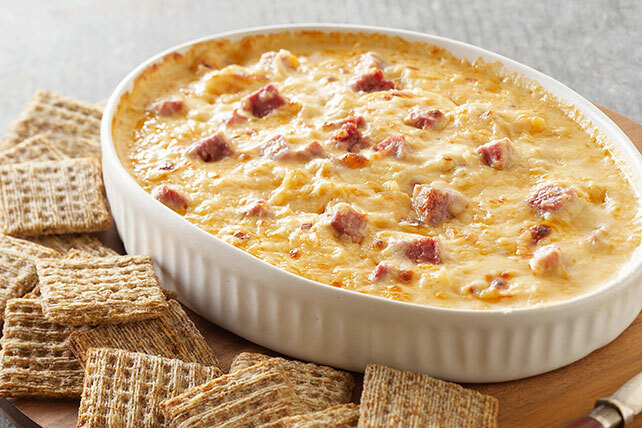 Make this Hot Reuben Dip by combining cream cheese, Thousand Island dressing and corned beef. This Hot Reuben Dip is our take on a New York deli classic. Mix cream cheese and dressing in medium bowl until blended. Add remaining ingredients; mix well. Spread onto bottom of 9-inch pie plate sprayed with cooking spray. Bake 20 min. or until heated through. Serve with your favorite crackers, such as woven rye crackers. Instead of baking the prepared spread, microwave it instead. Mix ingredients as directed; spread onto bottom of shallow microwaveable dish. Microwave on HIGH 2 to 3 min. or until heated through.